Will the sky ever listen again? A lone rice paddy stands flooded with water pumped from the ground near Deniliquin, New South Wales. In the face of water shortages, Australia’s rice industry has crashed, leaving farmers to convert from rice to other drought-resistant crops. DENILIQUIN, New South Wales – Late in the afternoon on December 16, 2008, as Phillipa (Pip) Rinaldi cleaned the glassware and readied her family’s bar and restaurant for the evening’s guests, she heard the first heavy drops of rain on the roof of the Riverview Motel. 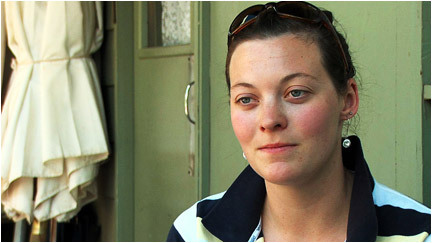 After more than a decade of severe drought, which more than three years ago forced Pip, her younger sister, and her parents to give up a farming life outside Deniliquin for a much harder existence as motel and restaurant owners in town, the midsummer shower seemed almost punitive, a damp excuse. I came home to celebrate my birthday, and my parents pulled me aside and said we sold the farm. The same can be said for this New South Wales town of 7,500 residents, most of whom are in one way or another tied to agriculture. Just eight years ago, Deniliquin was the center of a rice-growing region that produced a record 1.7-million-ton, $700-million crop. Much of that was processed, milled and exported by Sun Rice, a growers’ cooperative that represented more than half of Australia’s 2,500 rice farmers and is the fourth largest rice producer in the world. 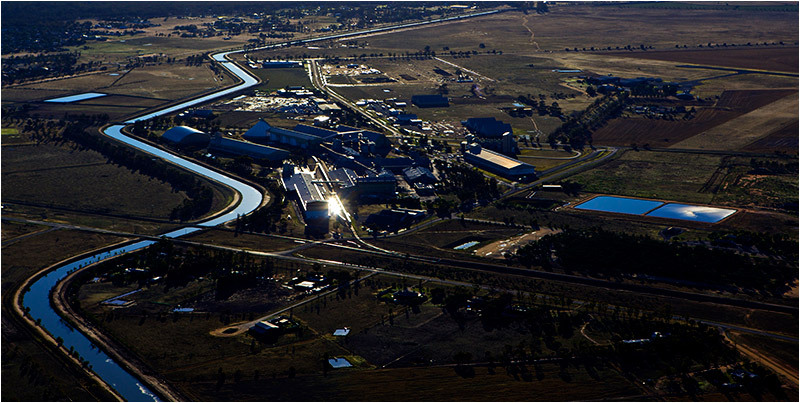 Sun Rice owned and operated the 39-year-old Deniliquin mill, the largest rice processor in the southern hemisphere. Before the drought, during rice harvests that typically started in March and lasted for months, trucks backed up from the gates of the mill, not far from Deniliquin’s center square, in a line that stretched for blocks and blocks, waiting to unload the crop. However, since the late 1990s, the epic drought in the Murray Darling Basin steadily diminished – and then last year wiped out – Australia’s rice crop. Just like the American Midwest, where factory closures ripped town economies, Deniliquin’s vanished rice economy is steadily disabling the culture of security, expectation, and familiarity that it once fostered. Perhaps most importantly, Deniliquin is now losing, arguably, its most important resource, today’s brightest young minds – just like those that have sustained it since the town’s settlement in the 19th century. And something less tangible: The characteristic Australian good cheer has been replaced by a grim stoicism. Pip’s father, Frank Rinaldi, bought his 700-acre farm about half an hour outside Deniliquin specifically to raise rice. Good crops meant prosperity for his family and the community. He sent his daughters to boarding school in Melbourne. Some nights during the harvest, the line of trucks was so long that Pip was dispatched by her mother, Dianne, to pick Frank up and bring him home for a few hours’ sleep, returning him to the line at 5 o’clock in the morning. The town ebbed and flowed with the rice harvest. The Sun Rice growers cooperative in Deniliquin once represented more than half of Australia’s 2,500 rice farmers. This mill, the largest in the southern hemisphere, now stands empty and shuttered (click image to enlarge). But as the drought gained a tighter grip on the Murray-Darling Basin, emptying the reservoirs and forcing New South Wales authorities to reduce water allocations to rice growers starting in 2000, the crop diminished. In 2003, producers raised 400,000 tons. In 2007, 200,000 tons. Last year, production amounted to just 18,000 tons, about the same as what the industry’s leaders anticipate this year, and the lowest harvest since 1929. The Rinaldi family, more fortunate than most, sold their farm in 2004. A neighbor made an offer, and then the Riverview Motel came on the market. The family, having endured two straight years without a rice crop that painted their bank statements with red ink, made the move. It came just in time. On November 8, 2007, Sun Rice chairman Gerry Lawson posted a notice in the region’s newspapers and sent letters to co-op members that said the company was “temporarily downscaling,” a euphemism for its decision to shut the 39-year-old Deniliquin mill and a second in Coleambally. Workers were sent home four days before Christmas. A shift at the mill in Leeton also was shut down. Roughly 225 people lost their jobs. The long lines of trucks haven’t been seen in Deniliquin since. But in their place came empty storefronts and dozens and dozens of “For Sale” signs in neighborhoods once so stable that when people moved in or out it was almost a community event. A number of the Rinaldis’ friends, hopeful that the drought would end, got stuck with land and equipment they couldn’t use and declining prospects for off-farm jobs. Marriages broke up. There was so much stress that in 2005, when mental health authorities held a meeting to talk about the situation, more than 2,000 people showed up. 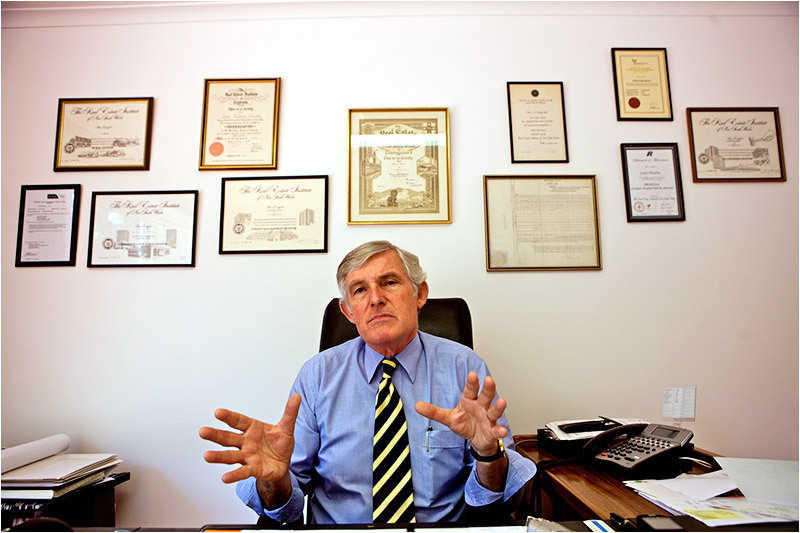 Lester Wheatley, a Realtor in Deniliquin, has seen the market drop precipitously as the agricultural community diminishes. “Our market here for residential houses is probably the worse it’s been in the 35 years I’ve been here,” he said. “In the last 12 months our buyer inquiry rate has collapsed about 80 percent. So that’s pretty powerful stuff.” Click image to enlarge. Still, the suicide rate in the Deniliquin region is twice the national average, according to federal health authorities. Serious farm accidents are on the rise, the result of tired growers trying to do too much on their own to save money. The toll on service workers also is high. Di Rinaldi, Pip’s mother, is a trained nurse who rose to become administrator of the 61-bed Deniliquin Hospital. She ended her health career to help with the motel, but still serves as the volunteer board chair of the Deniliquin Community Center. She sees dimensions of the drought and the farm crisis that few people do. She describes a bank manager, a friend, who had worked for 35 years in the business and recently quit. He told her he couldn’t face one more foreclosure, one more wrecked family. One night, not long ago, Di said, Frank came home very upset. “He said, ‘I need you to go with me to the pub tomorrow night. There’s this guy down there. Things aren’t going well for him. His wife has just walked out. His farm is going badly. And I think he’s suicidal.’” She told her husband to intervene on his own, which he did, apparently successfully. She recalled this without tears, in a matter-of-fact way. She had moved on, past the hurt and the fear. Still, it can rise up in her again at any time. “To see something go from fantastic to how it is now, where it is nothing, is really horrible,” she said. Keith Schneider, a former New York Times national correspondent, is senior editor and producer at Circle of Blue. J. Carl Ganter, an award-winning photojournalist, writer and broadcast reporter, is the co-founder and director of Circle of Blue. Contact Keith Schneider or contact Ganter at carl.ganter@circleofblue.org. For a complete list of credits, acknowledgements and other resources related to Circle of Blue’s coverage of “The Biggest Dry” please click here.